Can You Get Better in 20 Minutes? 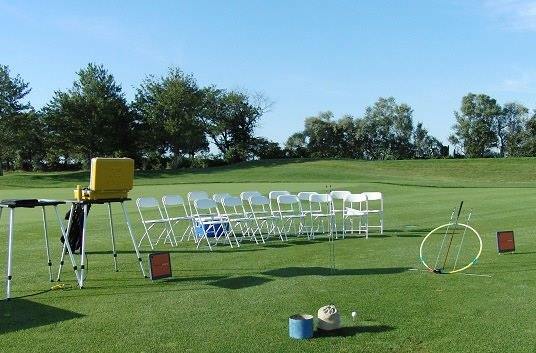 I recently ran an interesting promotion where I offered golfers an opportunity to gain 10 yards if they participated in a twenty minute TrackMan session. The cost was $50 and if they didn't gain the yardage their session was free. This meant I had to be on my game and I had to make simple and effective upgrades to get paid...it's not often a golfer can take a lesson and only have to pay for the lesson if they see immediate results! My reason for running the promotion was primarily to create interest and excitement in the new TrackMan unit and to give the Berkeley Hall membership a peek at what this technology can do for them. I had eighteen golfers, eleven men and seven ladies sign up and I encouraged each of the participants to focus on the driver. In case a participant wanted to work with an iron I had them each bring their driver and a seven iron along. When hitting the driver I try to get my students to have an attack angle of somewhere from 1 - 5 degrees up along with a club path of somewhere from 1 - 5 degrees from in to out. I prefer that most golfers hit out and up on the ball creating a high launch, low spin trajectory with the driver. We all could benefit from a few extra yards, no? The average swing speed for the men with the driver was 83.9mph. The top speed achieved was 96.1mph while the slowest was 70.1mph. Keep in mind that this event was promoted as a "distance" event and as a result the golfers who came out tended not be the longest of hitters. The average speed for the ladies with the driver was 65.6mph with the top speed being 73.4mph and the slowest being 60.3mph. Before any changes were made 7 golfers (a surprisingly low number in my opinion!) hit from out to in at an average of 3.3 degrees with the big stick. This means that their club path was travelling 3.3 degrees left (for a right hander) of the target at impact. After adjusting, the same 7 golfers averaged 0.8 degrees from in to out - a very positive change. Prior to any changes 4 golfers hit too much (in my opinion) from in to out at an average of 6.6 degrees. After the changes they averaged 2.2 degrees in to out - a far more respectable number. Not every golfer gained yardage, although the majority did. A few golfers actually lost some clubhead speed while they were working on the changes which were primarily in the address position. It was interesting to note how some golfers adapted and changed easily while others had a tough time. Similarly, I found the ladies to generally be more efficient in transferring the energy they created to the ball than the men. I've also noticed that LPGA golfers also tend to be more efficient than their PGA Tour counterparts, particularly with the driver. The mantra seems to be "the more energy you create, the more likely you are to waste it!" It does not have to be that way though. Every golfer who attended the event improved in an important area regarding how they deliver the club to the back of the ball. Quite a few golfers did not gain 10 yards, but they all left feeling like they had the knowledge and feel they needed in order to realize longer tee shots. One lady had a fantastic golf swing with very efficient numbers, but, primarily due to her petite size, she was unable to generate much clubhead speed. She had an older, heavy driver with a 70 gram shaft and so I spent most of our time talking to her about what equipment (lighter = faster) suited her best and what exercises (Momentus woosh) she could do to increase her speed with the driver. I'll be interested to see how she does with the new club. Almost all the participants commented that while the "numbers overload" from TrackMan was overwhelming at first, once we had isolated a particular problem (attack angle, club path, spin axis etc.) it seemed very simple. They were able to key in on one area and get a feel for how much change was required in order to reach their goal - all without much in the way of complicated, positional swing changes. The twenty minute time format worked well for the students and for me. They did not get overloaded with information and I had be concise and clear (for a change!) in what they needed to upgrade. So, back to the question, "Can you get better in twenty minutes?" I would have to say an emphatic yes. With the right feedback mechanism, which TrackMan certainly is, and a simple approach, you can make fairly substantial changes in a short period of time. The important thing moving forward is that you practice the changes in order to gain a measure of comfort and confidence in them - and as we know, that takes more than twenty minutes. The Golf Swing - Right or Wrong?